Ask Brandon: What Am I Getting Out Of My Tempur-Pedic? You are here: Home › Brandon's Sleep Tips › Ask Brandon: What am I Getting Out of My Tempur-Pedic? Your mattress should feel so comfortable that it is an automatic trigger to encourage you to relax and fall asleep. Make sure that your mattress is right for you by lying down for as long as you can in the store before you buy it. It is a very hands-on experience! With that being said, thank you for the wonderful questions this week! Q: I have a memory foam Tempur-Pedic mattress. Are there any health benefits I’m getting by sleeping on it? All I know is that it feels amazing! A: Thanks for asking! Yes–absolutely! Having a low pressure system to sleep on alleviates joints and takes the pressure off the muscle groups, which keeps the spine in alignment. To align the spine, you have to support the muscle groups correctly, and in doing so, you will take pressure off. You’re getting a great health benefit from a memory foam mattress and you’re going to get healing qualities because of that consistent support! Back pain when sleeping on a memory foam mattress is usually because of improper sleep position or memory foam that is not holding up to its shape, i.e. it’s cracked or it’s not the right density. A: I advise that one of you lay in the middle of the bed periodically. You should not spin the bed head to toe because you will put yourself in the wrong spinal alignment due to the existing impressions that have been made on the bed. If you both occasionally lay in the middle of the bed, you will make the bed feel more even left to right with less of a divisional point in the middle of the mattress. Thanks for asking, great question! Q:So I have a little twin mattress on the ground that I tell other people is a bed (I look like a kidnapping victim when I’m in my room). I’m in the market for an actual bed. What would my best bet be for a good comfortable bed that is still inexpensive? A: Thanks for asking! Sealy Posturepedic offers some great inexpensive options. So does Simmons & Serta (both of which are brands we do not carry). They’re all good. Some mattress experts would say, a bed under $1000 you could pick randomly and they would all be very similar. I would suggest purchasing the set (mattress, box spring and metal frame) for both comfort and to reduce the appearance of being a kidnapping victim 🙂 Have a great day! Continue to get 7-9 hours of sleep every night on a extraordinary mattress that works for you. 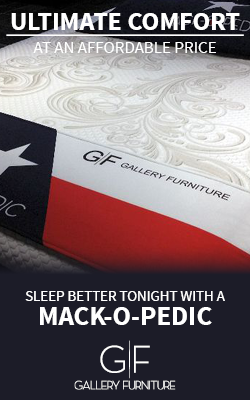 Stop by one of our 3 Gallery Furniture locations in Houston, TX –6006 N. Freeway, 2411 Post Oak, or, 7227 W. Grand Parkway South are happy to walk you through the process! If you have any questions, please email me at AskBrandonJackson@gmail.com.